The MHS Board meets the third Thursday of the month at 5:00 p.m. at Pratt Hall in the summer, and the Public Safety Building Conference Room in the winter. 1. According to Abby Marie Hemenway’s 1871 History of Vermont, Montgomery produced more of this for export than any other town in the county, possibly the State. What was she talking about? 2. According to the 1850 census, what was the ratio of sheep to cows in Montgomery? 3. According to annual census reporting, in 1870 Montgomery’s conversion to dairy farming was well under way with over 35,000 pounds of butter produced. What was the figure in 1880? 4. In 1914 Montgomery was the largest producer of maple sugar (not syrup) in Franklin County. How many pounds? This newsletter includes a link to photos of our recently completed work behind Pratt Hall. 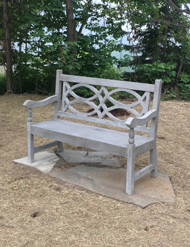 Inspired by some generous gifts from some of our past members' families, we wanted to create a pleasant area where one could just sit and think. Of course as soon as we finished the work the heat wave began and we've been busy watering to keep our new plants alive! Please check out the pictures, or stop by and take a look (but give the grass a little more time to fill in, thanks). 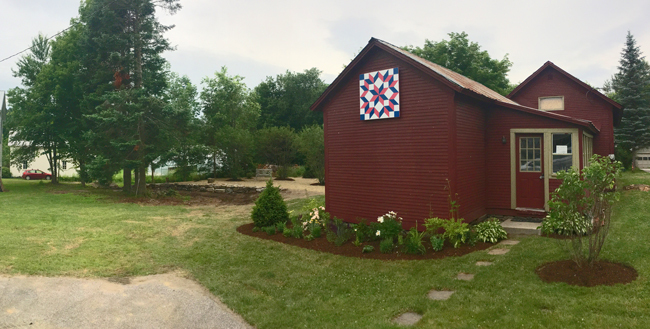 Last newsletter I excerpted a “Seven Days” article on Vermont’s small historical Societies by Rachel Elizabeth Jones. I paraphrased her description of them (us) and was compelled to create our latest T-shirt. It has our Pratt Hall logo and the phrase “a benign fringe element dallying with obscurity…since 1973”. This is sort of a “Keep Montgomery Weird” or “Eat More Kale” declaration that, hopefully inspires others to smile, think, and get involved. The meeting is Oct 27th at Woodstock, VT, and is open to all. Members of local societies can attend at a discounted rate. I plan to be there with my T-shirt on! Our major project for the Summer is landscaping our property behind Pratt Hall. Acquired in 2005, little had been done to it, and falling and leaning trees were a menace to our neighbors so we took the initiative. We hired "Nature By Design" (NBD) to create an attractive area suitable for meditation. We're calling it a Heritage Garden, a place where you can sit and reflect about all those who came before us and made our community, and our organization, such a terrific place. It features a decorative bench, stone wall, and flowering shrubs and perennials. It is a work in progress and we will no doubt add features over time. Our thanks to NBD, Avery Stanley, Charlie Fichman and crew, and The Men With Tools. Also our appreciation to a host of volunteer waterers under the expert eyes of Steve Hogan. 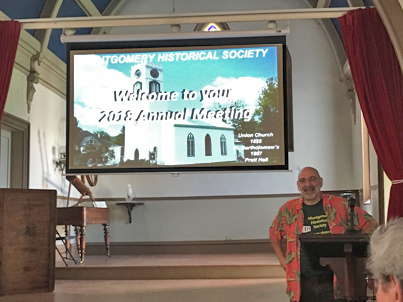 In May Pratt Hall hosted a "Friends of the Library" Vermont Humanities program on Charles Ross Taggert, the Old Time Vermont Fiddler. 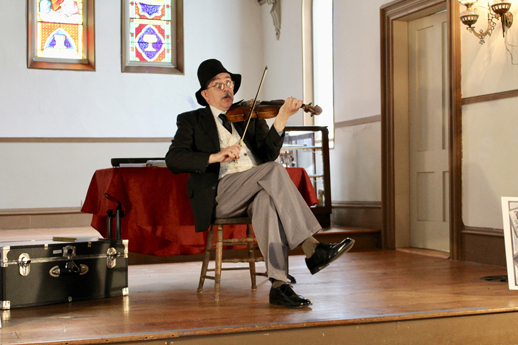 Adam Boyce inhabited the fiddler and told of his life and performed some of his acts. In August we will host a benefit concert for the Library on the 18th and on the 25th there will be a "Trinkets and Treasures " lawn sale. Our periodic lawn sale, Trinkets and Treasures, is on for Aug 25th. We’d like donations of good quality treasures, but no clothes, books, or electronics. They can be dropped off at the Heaton House on Saturday, Aug. 11th and 18th before the event. Email us if you have any questions or need to arrange another time. Thanks. Our bylaws require us to have an Annual Meeting every June to provide a "State of the Society" report and elect Board members. This year's was June 29th. About 60 members and guests attended the business meeting where Chairman Scott Perry presided. Thanks to your support the State of our Society remains very good. We are strong financially, meet our mission goals, and have fun doing it. 2017-18 saw a number of new initiatives which we hope will boost membership. Chairman Scott Perry presided over the business part of the evening and presented his and the officer's reports. After the business meeting 53 members and guests moved to the historic Black Lantern where we filled the dining room. Our thanks to the BL owners and staff for a delicious meal and relaxed atmosphere. 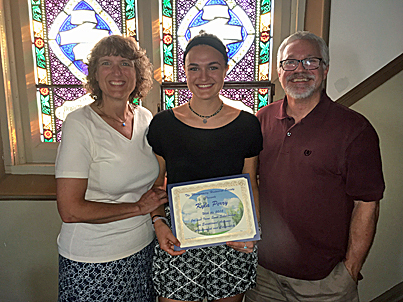 Our Joe and Irene Scott memorial scholarship was awarded to Kyla Perry. Kyla was her class valedictorian and will be attending the University of Vermont as a "Green and Gold" scholar in the fall. She will be majoring in Environmental Science and hopes to become a Marine Biologist . MHS scholarships are awarded to a graduating Montgomery senior going on to further education or training of any type. Applications are due May 1st every year. Applications can be downloaded from our web site. Besides the glory, winners receive a short biography of their scholarship's namesake, a check, a certificate, and a copy of the Montgomery Town History. Congratulations to Kyla and her proud parents. 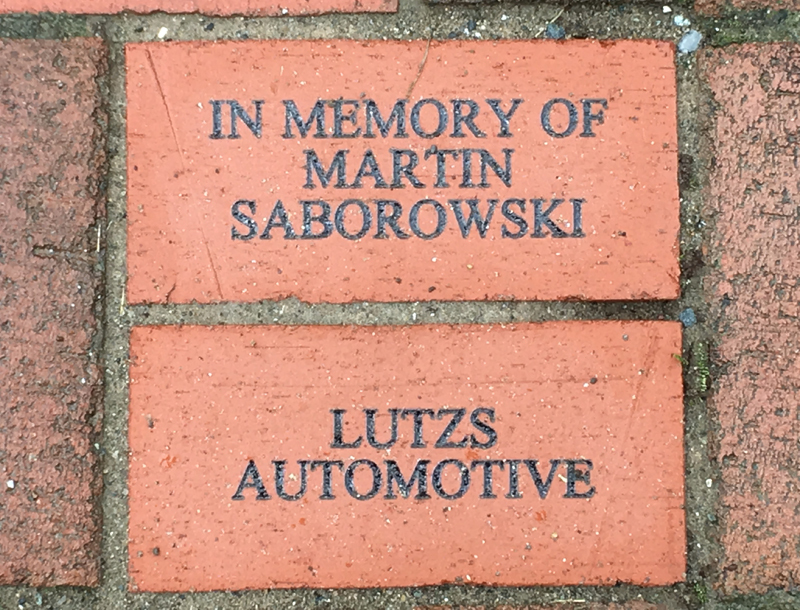 People continue to express interest in the engraved brick pavers and we installed 6 new ones in late June. We will continue to sell them as long as there is demand and will be expanding the brick area to the path behind the MHS sign. so there is plenty of room for more . The bricks also can be purchased on line at our History Store, by calling Board member Pat Farmer, or emailing us. We've also added a map on line, and at Pratt Hall, keyed to both a list by donor and a list by inscription. The Society's annual program was at the Hill West Cemetery (on West Hill) and was well attended. Our speaker was Montgomery's Reverend Dr. Titus L. Pressler. His ancestors served in a number of conflicts and wars, and he was assaulted while working as President of Edwardes College in Peshawar, Pakistan which also suffered a bomb attack. He provided a unique perspective on service and the importance of remembrance. Our thanks for a memorable speech. Our thanks also to Moderator Bill McGroarty, our poem reader, Sally Newton, our roll call reader Sue Wilson, American Legion Post 42 (Enosburg) for supporting our annual observance, and Parma Jewett for donuts and cinnamon buns. Yum! It's that time of year we offer a gentle reminder to join us if you haven't. Last year's membership rebounded to 197, just 3 short of our 200 goal. Reminder letters will be going out soon. Please join or rejoin us... every member matters! You can even do it on our web site. Just click the Membership link. If you've already joined... Thank You! Board member Sue Wilson organized our first ever Summer Farmers' Market last year, and it was such a huge success vendors and patrons alike requested its return this year. The market opened on Saturday, June 9th, and will continue into September. Fare includes meats, produce, baked goods, flowers, quilts, honey, maple syrup,and more. Thanks to all our vendors and all of our patrons. Stop by if you haven't already. Saturdays 9:00 a.m. to 1:00 p.m. through September 15th. Thank you Sue! Three new MHS items are on sale at the Farmers Market and our online store. 1. 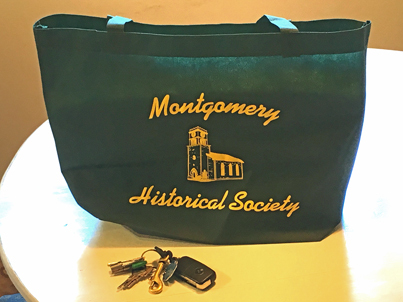 MHS Tote bags. Made from recycled materials and printed with the MHS Pratt Hall logo.. A stylish must have and just $2.50. 2. 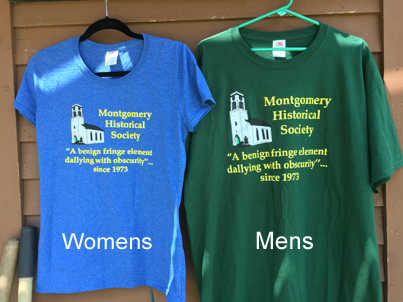 Men's and Women's T-shirts with the MHS Pratt Hall Logo and printed "benign fringe element dallying with obscurity"... since 1973". Just $15.00. Taken from a "Seven Days" article on Vermont's small historical societies. 3. Note cards based on the paintings of local artist, the Reverend Harold Babcock. 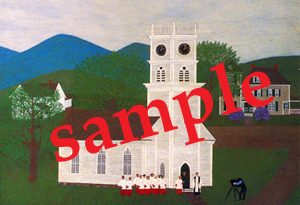 Painted in the primitive style like Grandma Moses, they depict Montgomery and area scenes from days gone by. Cards were produced under the supervision of the artist and sell for $1.00 a piece. Our thanks to Harold and Carolyn. Please click here for pictures and more information on these, and all of our other items. 1. b. Hemenway noted a crop of Timothy Grass, used for hay, rarely failed. 2. a. In 1850 the ratio of sheep to cows was 3 to1. 3. d. By 1880 Montgomery farms produced 180,000 pounds of butter, an over 5 fold increase in just 10 years. 4. d. In 1914 Montgomery produced 179,000 pounds of Maple Sugar. July 1952: Juvenile Court of the Catholic Order of Foresters established. August 1954: Montgomery Fire Department organized. September 1908: Hectorville Union Chapel dedicated. After failing to qualify last year you have carried the day and made us eligible for this annual grant program once again. TD Bank informed us that we would receive a grant of $1,010. We can always use more TD Bank account holders to designate the MHS their Affinity beneficiary. They don’t have to be members of the Society. In order to receive a check next year we need at least one more Member (checking account) while losing none, or we need an increase in the aggregate savings of those who’ve designated the MHS their Affinity partner, of over 1%. You can call Rachael Hackett at TD Bank in Enosburg at 933-2116 if you have any questions or wish to enroll. Tell your friends! The MHS is code J6. It will cost you/them nothing and no personal information is shared with the MHS. Thank you. We are sad to report the death of member Andrew Massey. 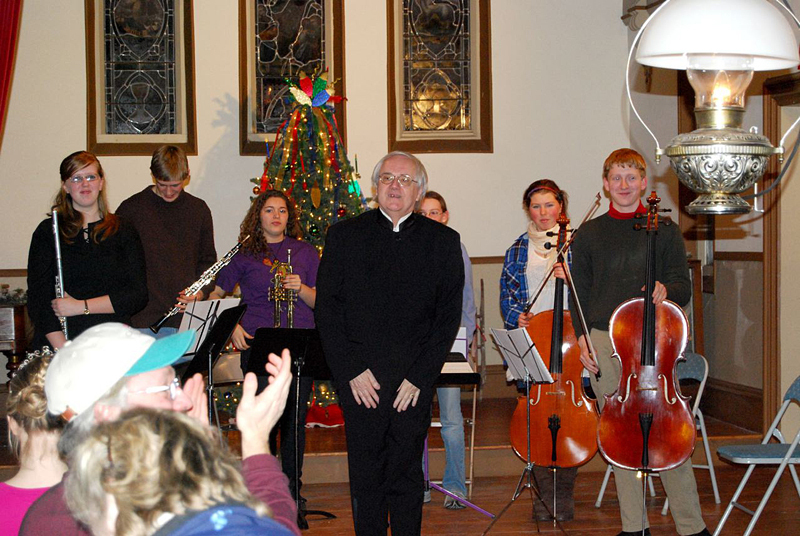 Andrew is perhaps best known to MHS members as the conductor of our annual Candles and Carols sing-along at Christmas. He recruited real musicians, scored the selected carols, and then attempted to lead the gathered masses (some tone deaf) with no rehearsal. Somehow we always got through it. Our love and condolences to Sabra, Robin and Sebastian. We will miss Andrew and cherish our memories of him. Member John Kuryloski joined the MHS Board of Directors in May and was elected officially at the Annual Meeting. He and wife Kathryn are full time Montgomerians now living at the end of Purrier Farm Rd. His first stint with the Men With Tools involved moving rocks for the new wall in the Heritage Garden and he stuck with us anyway! Welcome aboard John and Kathryn.